The Pug is one of the oldest breeds known today, believed to have originated from the Orient before 400 BC. They were brought from China to Europe in the sixteenth century and were popularized in Western Europe by the House of Orange of the Netherlands and the House of Stuart. The Pug may have descended from a shorthaired Pekinese. Another theory is that it is the result of crossing a small Bulldog. No one really knows what the name means, either. Some say it is European slang for “dear one.” Others contend that it’s from the Latin word pugnus, meaning “fist.” Though why someone would look at a Pug and think “fist” is anyone’s guess. One thing we do know is that they were never working dogs. They were designed for one thing – to love and to just look so darn cute! The breed motto is multum in parvo, which means “a lot in a small package.” The Pug is quiet, but alert, affectionate and patient. They are true “gentlemen” and “ladies.” They have a happy-go-lucky personality. 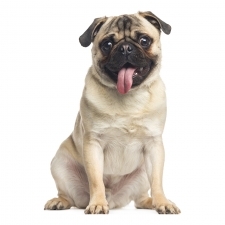 The Pug is described as loving, animated and peppy. They will keep you laughing with their playful and rambunctious personality. Pugs are strongwilled but rarely aggressive, and are suitable for families with children. Most Pugs are very fond of children and sturdy enough to properly play with them. These precious little dogs make the perfect family pet. Pugs usually weigh between 14 to 20 pounds and stand approximately 12 to 14 inches tall. Be careful, pugs tend to gain weight very easy. They have a broad, stocky, square body and a great big head. Their coat is fine and short and comes in silver, apricot, fawn or black. Napoleon’s wife, Josephine, had a Pug named Fortune. It is said to have bitten Napoleon when he tried to remove it from their bed. Josephine declared, “If the Pug does not sleep in our bed, neither do I”! Some of the Pug’s talents include watchdog and performing tricks. Basically, they are just little love bugs.